I’d been reading about planting potatoes in tires, and the high yields you can get when doing so. Hubby and I had been trawling craigslist to try to find old tires, but to no avail. When we happened to purchase some seed potatoes on clearance, we thought we’d better get on the ball. We called a couple of auto dismantlers (aka junkyards – but look under auto dismantler in the yellow pages). 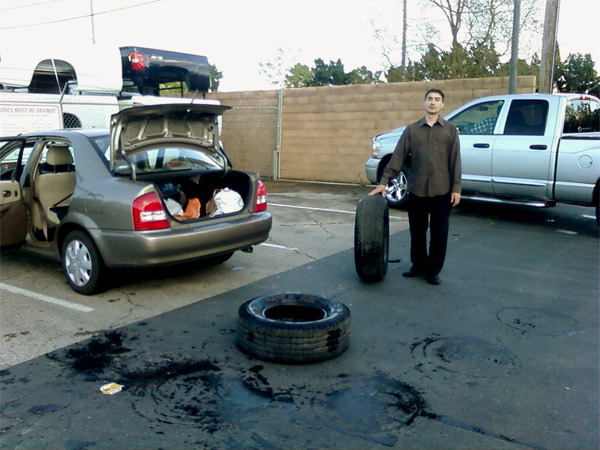 I found out that you can get the old tires for free, because otherwise they have to pay to have them hauled away. 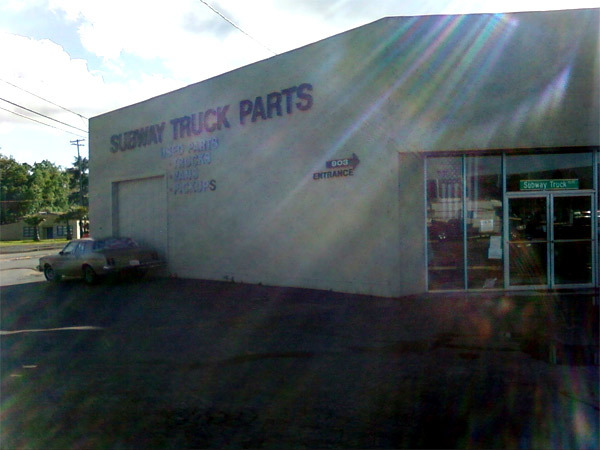 We happened to pick a truck dismantler place. So we got some pretty big tires. Lots of growing space! The awesome thing about growing potatoes in tires is that it’s easy to do, it saves space, and you (allegedly) get a high yield. You’ll want three tires for each stack. First tire goes on the ground, in a place of your choosing. Fill the tire with dirt. Next step – take out your seed potatoes. Cut the potatoes into pieces, two eyes to a piece. We skipped this step since our seed potatoes were, ahem, very obviously clearance potatoes. They may live, they may not. But this way you’ll get more potato plants. Plant them into your tire. Next step – once your potato plants come up, a few inches high, put another tire on top and add more soil, leaving the very tops of the plants bare. As they grow higher, repeat, up until the top of the third tire. 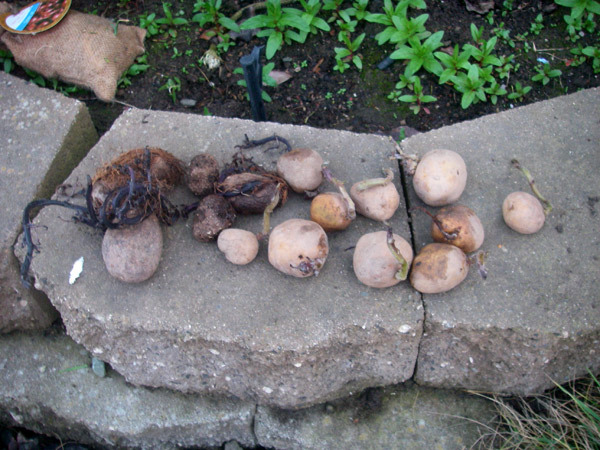 When the plants brown and wilt, it’s time to harvest your potatoes! I’ll let you know how this works out for us. COST: $3-5 for seed potatoes, check your local hardware store. 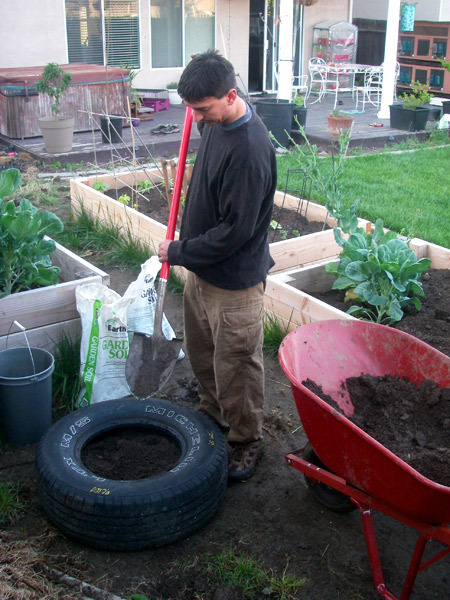 Tires are free, and I’ll be posting about how to cut down your costs for gardening soil. TIME INVESTMENT: 30 minutes to pick up the tires, 30 minutes to plant. In other news, we’ve transitioned from winter into spring. Our tomato plants are going strong. We also purchased a dwarf peach tree. 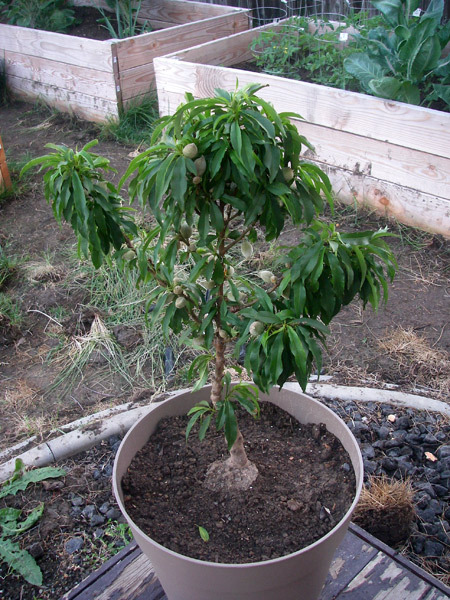 For those with little space, dwarf fruit trees can be a great investment. $23 for this one. I’ll be back soon to post about what happened with our sake brewing – start to finish, and whether or not it’s a sustainability win or fail. Actually, it can be easier that this. I successfully raised potatoes for a number of years by simply tilling the ground, laying the seed potatoes on top op the ground and covering them with 2 feet of loose straw. By the fall the straw had broken down to a fairly thin layer that could be pulled back and the potatoes could be harvested by just picking them up. New potatoes could be picked without digging up or killing the plant by reaching down through the straw. The potato patch was rotated in the garden yearly as the ground was enhanced by addition of organic matter and I would plant other things in the improved ground the next year. Hay will also work and it doesn’t matter if it is spoiled hay.though it may add some weed seeds. I have heard of people using newspaper also. Whatever you use for cover need to be thick enough and break down slowly enough to keep the crop covered until fall. Grass clippings and such might work but more would have to be added frequently. Hi James, what an awesome idea! I love that the straw would allow for continuous harvesting of the potatoes, in addition to it being turned into compost. Is the yield pretty high? And do you think you’d be able to use this method inside tires or some sort of container? My husband and I don’t have much space, and then there’s the ever-curious dog. She’s been taught to stay out of containters/garden beds, but everything else is fair game. Plus we live on top of a bunch of clay – raising things up has worked better for us. I’d love to give this method a go; thank you so much for sharing! Ran across your page/site here and have now spent an afternoon looking & enjoying everything you’ve done! I’m so impressed and Jealous!!!!! Keeping a very long story, short. Lived in Northern Cali for 25 years, have now lived in Anchorage AK for 14 years. ( Yes, I’m old) LOL. Anyway, What you’ve done is exactly what I’ve been telling my Adult children in Cali they Need to do! Recently came back to AK (after summer enjoying Cali & Ore), with an passion to make it happen up here! Checking you guys out has made me all the more excited, I’ve just GOT to find a way! Thx for sharing!!!! Thanks for checking things out! I know some people do manage to make it work in Alaska…if you check out the backyardchickens.com message board, there are people who have found ways to keep chickens and quails in very cold temps. I’ve seen an article somewhere, too, where someone in Alaska had a great cold-weather veggie garden. And you can always start a small indoor garden if you have an area with enough light. 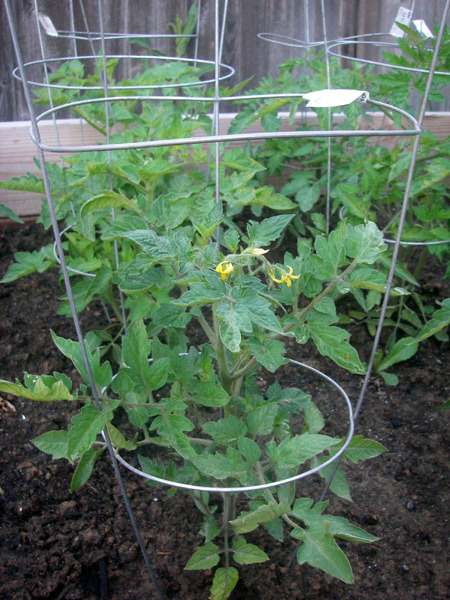 I meant to this year, but hadn’t had the chance – but next year I will try to grow some tomatoes indoors. I think these things can be done if you choose cold-hardy varieties and adjust conditions as much as you can. Can you tell I’m really excited for you? =) I’ve found, so far, that it is both a healthier and cheaper way to live.